Blue Bolt #4 was the first story created in the definitive Simon and Kirby manner with all the pencils done by Jack and the inking by Joe. While previous Blue Bolt installments were quite nice, it is with BB #4 that the Simon and Kirby magic really unfolds. Exciting visuals, unusual perspectives and a great story. Both Joe and Jack had done their own individual work before this but it lacked the special qualities found in BB #4. Even the work they had done together in Blue Bolt #2 and #3 or Daring Mystery #6 is not quite as good. Only Kirby’s “Mercury in the 20th Century” for Red Raven #1 matches BB #4. The Blue Bolt story may have been signed by Joe Simon alone, but it was certainly a Simon and Kirby creation. The Kirby Checklist states that Simon got assists in the inking from Avison and Gabriele. While I cannot prove this to be incorrect I also cannot find any evidence of it. The inking looks like the hand of one artist and that was Simon. Joe had made great strides in his inking and much of that can probably be credited to his working with Jack. In fact the inking of the robot and some of the other devices was done in the manner that Kirby had already been doing for his science fiction stories. While Kirby was and would remain a better inker, Simon’s inking talent far exceeded the abilities at that time of Avison or Gabriele. 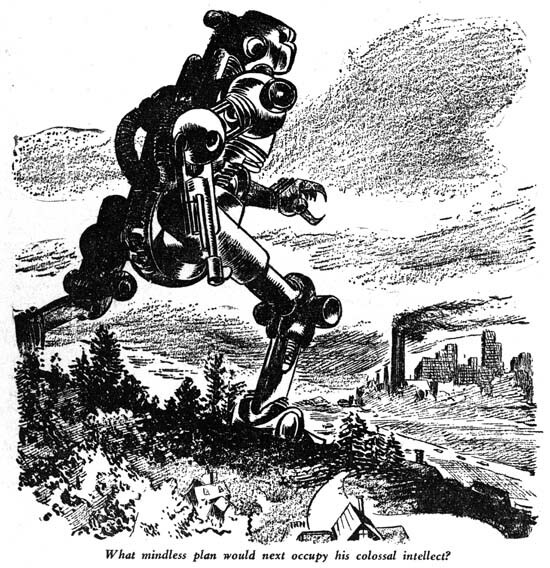 One of the star attractions of the Blue Bolt #4 story was the formidable robot. The splash panel shows a exciting confrontation between Blue Bolt and the mechanical foe. The story takes a different, but still dramatic, turn. The robot’s murderous rampage is handled with what would be typical Simon and Kirby restraint. A restraint that would not diminish but actually enhance the effect. Close-ups, silhouettes and shadows would provide the substance while leaving it to the reader’s imagination to fill in the rest. Both Simon and Kirby would do more than just comic books while working at Timely. They would also supply art for some of the pulps that the company produced. The pulp art was created under different circumstances and with unique techniques. As far as I can tell illustrations were not joint efforts but were individually executed instead. The pencils and inks that were used to create comic book art were replaced with the use of a special textured paper that would translate pencils into dots suitable for printing. While the pulp art may not shed much light on the beginnings of the Simon and Kirby partnership they sometimes are not completely independent of the comic book art. The horrific robot from Blue Bolt #4 makes a reappearance in Marvel Stories volume 2 number 2 a couple of months later. The details may differ but both share one clawed hand with the other arm transformed into a gun. While the robot drawn for the pulp story “A Dictator for all Time” might have been impressive it really had nothing to do with the story. There we find a rather benign machine more of an immense computer than a terrifying weapon. Another unidentified letter was used for Blue Bolt #4. This letter differed from the one used for BB #3 in the form of the letters used for ‘G’, ‘J’, ‘K’, ‘M’ and ‘W’. It may seem surprising that so many different letterers would work on Blue Bolt but Joe’s position as editor for first Fox then Timely probably provided a lot of resources to turn to. The letterer for Blue Bolt #4 did the most professional work to appear in Blue Bolt to date. One of his interesting contributions was to do caption lettering with a slight slant upward to the right while keeping balloon text as vertical. The letterer for BB #4 used some larger and specially formed first letters in the captions. A similar approach was used by Howard Ferguson at this time but his first caption letters are even more special. 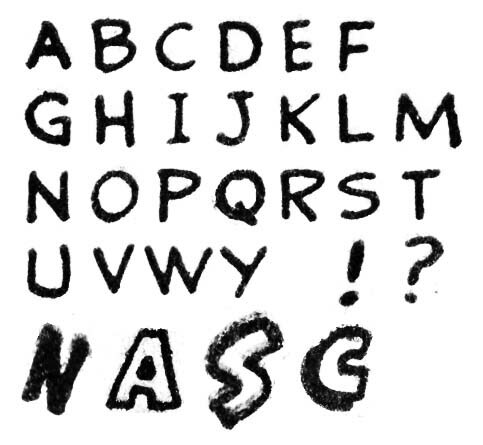 While the BB #4 letterer provided one of this first caption letter with a 3-D effect shadow he never provides the sort of abstract black shapes that Ferguson used. 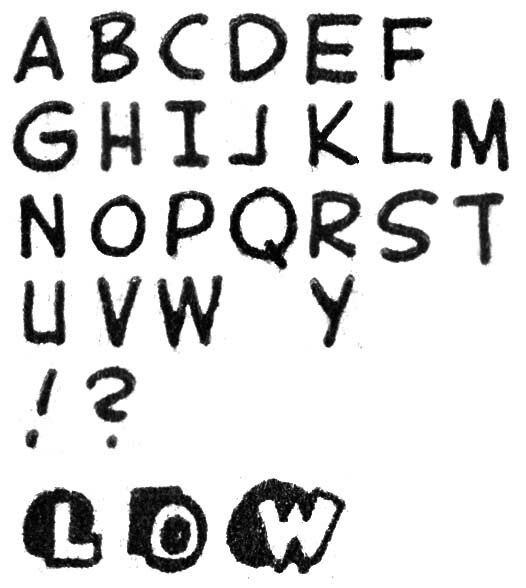 The difference between the two letterers also shows up in their letters ‘G’ and ‘J’. Actually not all of Blue Bolt #4 was lettered by the individual discussed above. One page, page 9, was lettered by yet another artist. This page lacks the slanted lettering to the captions as well as any special effects to the first caption letter. The letters ‘G’ and ‘Y’ are distinct between the two. 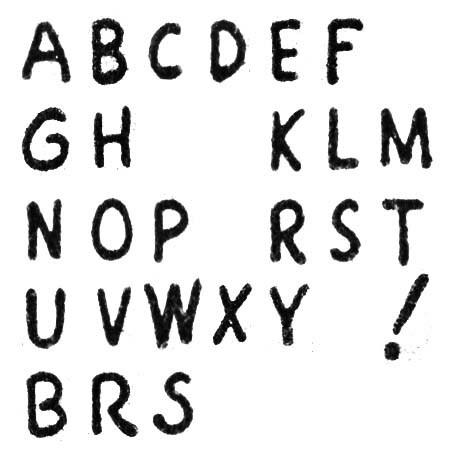 The second letterer also had a tendency to fail to properly connect the lines in ‘B’ and ‘R’ as shown in the bottom line of lettering examples above. His letter ‘S’ is somewhat variable but often has a bottom that is proportionally larger than the top. As if it was not enough that there were two letterers to work on Blue Bolt #4, one caption (panel 6 on page 9) was lettered by Joe Simon. It has his very distinctive ‘W’ and recognizable ‘M’. 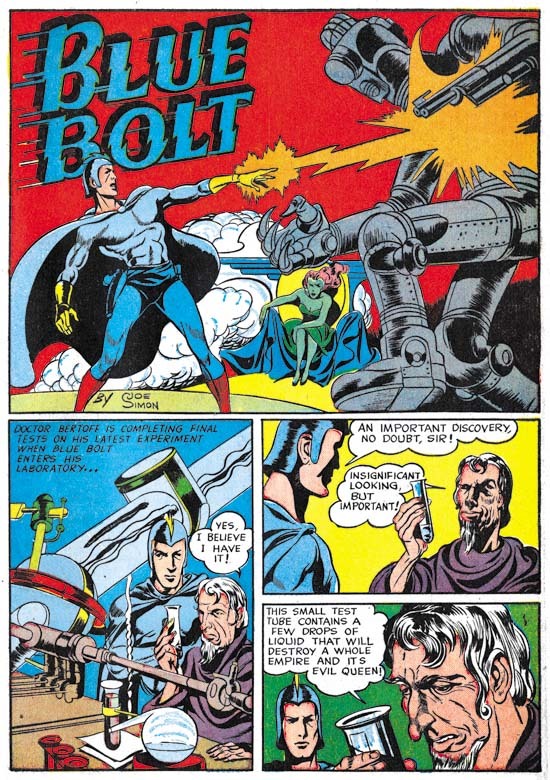 When Simon and Kirby first started working together for story art it was Jack helping out on a few pages for Blue Bolt #2 (July 1940) and #3 (August 1940). In August and September work was also done for Timely. Some of this later work (Blue Bolt #4) was done in what would be the classic Simon and Kirby manner, that is Jack providing the pencils with Joe doing the inking. But other work seems to have been mostly done by Kirby with little, if any, help from Simon (“Cosmic Carson”, Red Raven #1). Other distribution of working efforts were also done. Even greater variation is found in the lettering. Sometimes Simon or Kirby would do the lettering. Otherwise a number of different letterers were employed. Some more professional than others. One of these was Howard Ferguson who in the future would play an important roll as the definitive Simon and Kirby letterer. However initially Ferguson did more lettering for features not created by Simon and Kirby. What we have seen so far is not the sudden teaming up of Simon and Kirby but rather Joe putting together comic books using a variety of resources in a variety of ways.